Thomas Aquinas (1225-1274) - Thomas Aquinas is not simply a major figure in the Catholic Church, he is considered to be perhaps the foremost Christian philosopher in history. He ranks up there with the likes of Averroes for the Muslim faith and Maimonides for the Jewish faith (interestingly all three lived in roughly the same era). He was a theologian, but approached theology from an intellectual standpoint. That is, he did not just accept his faith at face value, but espoused the support of it using external evidence. For example, he was a strong proponent of "natural" theology, which was the observation of the natural world to help explain the existence of God. In this respect, he borrowed from the ancient Greeks, who did the same thing. 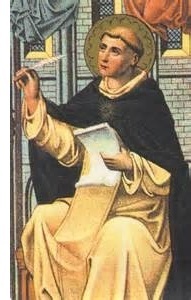 Aquinas was a student of Greek Philosophy and even sought, in his writings, to use Greek thinkers to support Christian theology (similar to what the early Muslim philosophers and Maimonides both did). Interestingly, the three greatest influences on Aquinas' life were Aristotle, Averroes and Maimonides (all non-Christians). This is not to say that he did not learn from Christians though. His mentor was John of St. Julian, a Dominican monk from Naples. And he was trained in arts and sciences as well. He studied math, geometry, astronomy and music under Petrus de Ibernia. His two most well-known works are the Summa Theologica, which is Aquinas' comprehensive analysis of Christianity (although it was never finished), and the Summa contra Gentiles, which is a collection of commentaries on both the Scriptures and non-Christian works (such as Aristotle) in his attempt to reconcile the two trains of thought. He is also the father of a critical form of thinking known as Thomism. It's a little difficult to understand, but as near as I can figure, Thomism argues that there is an ultimate truth in the universe and that it is discernible through examination. So influential was Aquinas that in the following centuries, the development of modern philosophy was a direct response to his work. As a young man he became a Dominican friar (another major order along with Franciscans) and priest (unlike Francis of Assisi, he was ordained) , and many consider him to be the Catholic Church's greatest mind ever.